Last Wednesday, Beasts producer Michael Gottwald participated in a live Facebook Q&A on our official page. The response was overwhelming and we apologize for not getting to everyone's questions in the hour we had allotted. But, we are planning another series of Q&A's with other members of the BOTSW cast and crew in the coming weeks, so stay tuned for more information! We went through all your questions and noticed that there were some overlaps. So, we've compiled the Q's and A's here in case you might have missed it, complete with hyperlinks! Check back often as we'll try to get to some of those still unanswered and keep you posted on future opportunities to interact with the team. Thanks to all who participated! Arturo Ochoa (Cal State Long Beach): What drew you to produce Beasts? Michael Gottwald: It wasn't so much that I was drawn to produce Beasts as I believed very firmly in Benh and his ability to make a film that I would not only love but also believe in, and make it in a way that I believed in. Jake Ramsay (Muhlenberg): Greatest challenge and were you most proud of? MG: Greatest challenge AND what I'm most proud of is the casting operation that we put into place to find all our amazing actors, most of whom had never acted before. As a result we found Quvenzhané Wallis, who is nominated for an Oscar, and Dwight Henry, who agreed to take the part only when we made it clear that not only would we work around his schedule as a baker but that the film could actually be helpful to his bakery. Now after the exposure of the film, he's part of a new line of grocery stores in New Orleans, he's opening a new bakery in the French Quarter, and he's working with a well known restaurateur in NYC to open a bakery in Harlem. I'm proud that we found these incredible people. Elliot Lobell (SUNY Purchase):I just saw Beasts for the third time in theaters! Awesome. What was the most challenging scene to film? MG: I think that is a better question for Benh, but I know that personally/emotionally, the scene between Wink and Hushpuppy at his deathbed was particularly draining and challenging. Everyone was crying: Benh, Ben Richardson, the cinematographer, Quvenzhané's mom, the boom operator, and of course Dwight and Quvenzhané. From a personal perspective, on set, I was in charge of coordinating talent and extras, the scene at the beginning, of the town celebration, with the baby race etc., was very tough. The school-boat scenes, with all those children, was tough too.Tyler Chick (Harrisburg, PA):What films are in the future for you? Of all the roles you've taken on in film making, what is your favorite? MG: For me personally, I'm producing a film called Ping Pong Summer, directed by Michael Tully, that is in post right now. It's a coming of age comedy set in Ocean City Maryland in 1985. It combines some of the local non professional casting that we did on Beasts, with kids native to the Ocean City area, with name actors like Susan Sarandon and Lea Thompson. 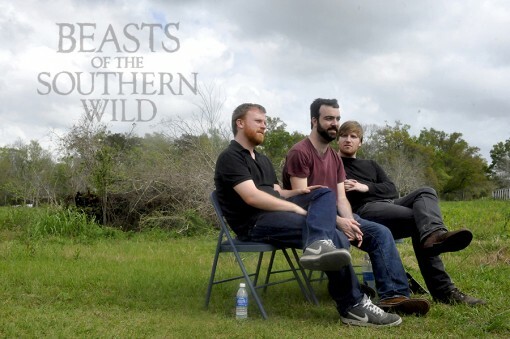 I'm also producing the third film by the Ross Brothers, amazing documentary filmmakers who we met while we were in New Orleans during development on Beasts. Their third film is called Western and is a portrait of a border town in SW Texas. Of all the roles I've taken on, I think that doing the (very non traditional kind of) casting that we did on "Beasts" has been my favorite, because auditions functioned more like interviews, and I got to know a whole lot of fascinating people and hear a lot of fascinating stories. Also I got to play pretend with a lot of little kids. I got to be extremely goofy in those auditions. Which is always fun. Leah Rose Morgan:What was the illness that Wink died from? MG: The illness has a real name that escapes me right now. Lucy would know. Let me email her and see if I can find out right now. But it is a blood condition. MG: Leptospirosis!!! That's the name of what Wink had. Which causes heart disease/failure. Brian Lee Anderson (Cuba, Illinois):Where to begin? I will start... with THANK YOU! MG: Thank you! I'm glad you liked the film! I will take your thank you but it really goes to the hundreds of people who made this film work, and especially to Benh who worked every single day (except when the Giants or Saints were playing) for 4 years on this film. Cale Espinel (CSU Dominguez Hills):What did you want to convey with the score? I loved it. Editor's Note:Buy the soundtrack here! Andrea Kristina:Just wondering if there will be any other tales in Hushpuppy's life to tell on the big screen? This was just such an amazingly different and heartfelt film, and I thank you for it. MG: A funny question, and one better suited for Benh. If I answer this question definitively yes or no, I will get in trouble, so let me just say that no one is forming an exploratory committee about that. Jon Martin (Managing Editor, Cherokee Chronicle):Why were you guys so adamant about casting Dwight Henry - a man with no major acting experience? He says he turned down the role several times before accepting. What made him special? He turned out to be the perfect choice. MG: Benh really responded to Dwight's charisma and perspective on life, but also that he had lived through some things that Wink was dealing with. He's an amazing man, extremely hard working, which I know Benh appreciated, and at the end of the day when we would improv some scenes with him you could see his life experience come out in the way that he acted. Though we did consider some professional actors, at the end of the day we knew that the challenge and idea of casting Dwight was perfect for the whole crazy challenge of the movie. I had faith that Benh would be able to work with him as an actor, and I knew that myself and the team were ready to do everything necessary to make this idea work. So we would come to the bakery late at night to rehearse with him -- we would totally work around his schedule, which is the only way that the whole thing could work for him. But we thought of all the people we saw, Dwight could bring Wink to life in a real way that fit with the fabric of the film. Vicki Sayer Aldrich:I don't have any questions however, I will take this opportunity to say thanks to you for making such an amazing movie! Anna Ruch (DC): What do you wish most for people to take away from the film? Ryan Penland (CSU Chico):How did you pull the funds together to make this film? MG: The film was entirely supported by non-profits, which is very cool and something that we're very proud of. The primary supporter and our partner on the film is Cinereach, an absolutely fundamentally earth-shifting organization that is upending the world of independent filmmaking. People ask how a crazy movie like this got made, and yes of course we had to make it in Louisiana, but the only way it was allowed to be made in all of the crazy ways that it was, was because of Cinereach. When we said "We want to cast this 6 year old as Hushpuppy," they said sure. When we said we want to film goats on floating boats with children in them, in summer in Southern Louisiana, they said, "Go forth." We wouldn't be here talking about this film, or have experienced any of this, if not for their faith in Benh and our team. Additional supporters include: Rooftop Films, the San Francisco Film Society's Kenneth Rainin Fund, the NHK/Sundance International Filmmakers Award... And the Sundance Institute did the unthinkable of taking this movie under its wing when it was just a nutjob screenplay by a couple of camp friends. Kelley Bella: What did you think about the Bell Hooks critque about a white director director, directing the story of “poor” African Americans? MG: First of all, I do want to say that I have personally have admired Bell Hooks' work since college. I don't want to engage too much with these kinds of critiques of the film because I think we end up down a rabbit hole, but I think that hooks's article underestimates the extent to which this film was made not by a singular person but as an entire community endeavor, a community that includes the very strong voices and life experiences of Quvenzhané Wallis, Dwight Henry, and the whole cast and crew. The script was not some sacred thing that Benh brought to some foreign world he was not a part of and had them conform to it -- quite the opposite. Benh and the actors would collaborate to the point where if something didn't feel right for Dwight or Quvenzhané to say, in the way that they understood their character, they would alter what the line was to fit that. Similarly, I think that the film is not just about Wink and Hushpuppy, but rather the whole community of the Bathtub, which is far from singularly African-American. The Bathtub is a created place in a fictional movie precisely because it puts all of these disparate elements of Southern Louisiana in one place. All of that cannot actually be found in one town in Louisiana, and similarly, if you try to engage with the film as a document of some sort of objective reality, you will be led astray. Not mistaking empirical reality for subjective reality is a principle I learned from Sylvia Winter, a thinker who I believe bell hooks would appreciate. Michael Tully (Univ. Maryland):If you had four takes to do the fourteenth scene on the ninth day of shooting, how many feet of film would you shoot? And why? (Please don't let your answer be less than 7,000 words). MG: Who are you? Please get this troll out of here. Thank you. jk. Ibrahim Mursal:For an independent production that made it big like yours, what is the secret ? How did you make it look so professional? MG: Wow, I don't know if we hear that the film looks professional very often, but thank you, I think (more often people are telling us that they got sick from the shaking camera). I don't know how or to what to attribute the "professional" look to... We used super 16 millimeter film, which I think gives the movie the texture of real film (because it is real film), and we had great partners in Skywalker Sound for our sound mix as well as Alphacine for our color correct. That's kind of a nerdy way to answer the question, but I think it gets at what you're asking. And as far as fiscal support, see my above answer about Cinereach. They approached Benh at film festival after a screening of his short film "Glory at Sea" and said "We want to make your next film, whatever it is." And they kept their promise! MG: Hi Charlois. I miss you. Good job coordinating the Transportation! Charlotte Dean, everyone!!! Tyler DePerro (St. John Jesuit): This isn't your typical Hollywood movie - was it difficult to get it financed? MG: See the above answers about Cinereach. It did require a whole year of development to come up with a plan for how we would shoot it, who we would cast in it, what crew members we wanted it, and what the budget would look like on paper. That was a challenging year. But in general, I think we are some of the luckiest people on earth as far as our experience with Cinereach. Nathan Menon:Where the hell did you find Quvenzhané Wallis? MG: We found her in the Houma Library, Main Branch, 151 Library Drive, Houma LA 70360. A state of the art library, by the way, if you're ever in the Houma area. I'm in New York City and still haven't found a library that compares. She walked in to an audition that we advertised with flyers and in elementary schools - the audition was for girls between the ages of 6 and 9, she was 5, but she snuck in anyway. This was all part of a 9 month search, between 3500 and 4000 girls, in a roughly 250 mile radius of New Orleans. There was a lot of Diet Dr. Pepper bought at very rural gas stations. Rhonda Billiot (South Lafourche High School):I have a question in the bar scene is that Hushpuppy’s mom? MG: Like much of the film, that is totally up for your personal interpretation, there is no correct answer. She is certainly presented such that she can be if you want it to be, or she could just be a momentary maternal presence that Hushpuppy needs at the moment before going back to her dad. Babette Annapurna Ory (UCLA):I am curious, how did the story came to fruition? Vivian Miller (FSU): Will you publish a book of the movie with screenplay and photos? MG: I think that is out, somewhere, already. Or if it's not, I imagine that one day it will be. I'd encourage you to get the Blu-ray, which has a bunch of extra features on it that I think you'd enjoy. MG: Hola! Gracias por escribirme. No, I don't think any of us ever imagined all of this. The film was finished 2 days before Sundance so there wasn't much time to think beyond just taking it to the film festival and hoping for the best. This last year has been 100% insane and surreal for us. Renan Lambert (Brazil):First of all, congrats on such a work, I gotta say, I’'ve never cried so much watching a movie, this is such a masterpiece and it make us rethink all of our living and specially our fears. My question is, was it hard to work with Quvenzhané because of her age? Can you confirm that the lady at the inn who dances with Hushpuppy was her mother? God that scene was fantastic. A hug from Brazil by the way! MG: Actually, her positive attitude, her very magnetic personality, and the fact that she was constantly having fun elevated the vibe of the set and made things feel somewhat lighter even if what was going on was very challenging. As far as working with her as an actress, it was actually a fairly traditional process between her and Benh, in that he would tell her what was going on in the scene and what's going on for Hushpuppy, she would say "I get it I get it," and then she would go in and nail it. If you think about it, playing pretend is not a foreign idea for a six year-old. MG: Ok guys I have to get off this thing, but this has been fun (and truly exhausting). Sorry to everyone getting all these comments in your inbox right now! And sorry I didn't get to answer everyone's questions! Please tell your friends to check out where the film is playing at www.beastsofthesouthernwild.com and if it's not playing near you, go grab the DVD or Blu-Ray. Lots of good stuff on there. BEAST IT!